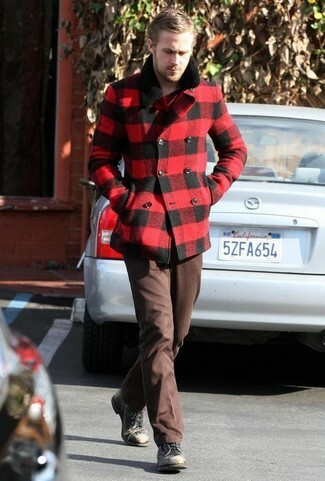 Wear a red and black gingham pea coat with dark brown dress pants for a sharp, fashionable look. 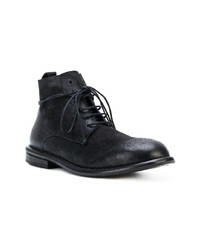 Add a sportier twist to your getup with black leather casual boots. So as you can see, being a dapper dude doesn't require that much effort. 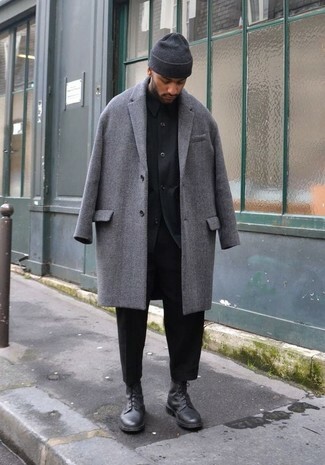 Just wear a grey overcoat and black chinos and you'll look incredibly stylish. 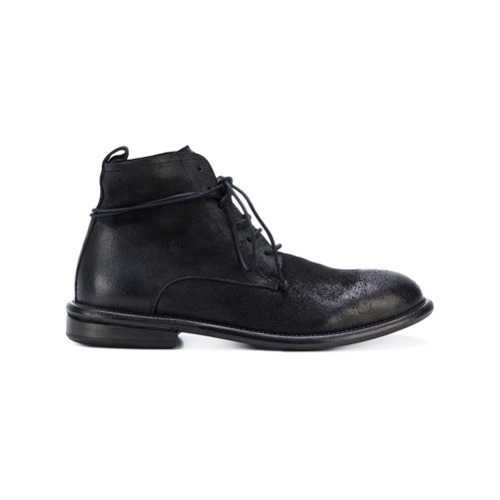 When it comes to shoes, this getup is round off wonderfully with Marsèll bombe sole military boots from farfetch.com. 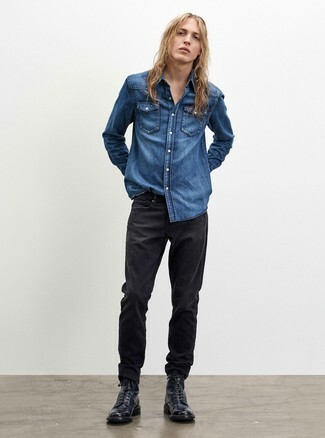 If you're searching for a casual yet dapper getup, opt for a blue denim shirt and black jeans. Both items are totally comfortable and will look great paired together. Channel your inner Ryan Gosling and choose a pair of Marsèll bombe sole military boots to class up your getup. 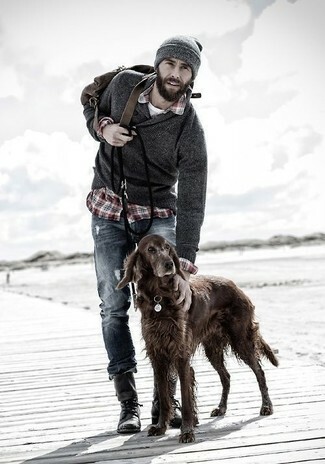 If you're on a mission for a casual yet on-trend look, try teaming a grey shawl-neck sweater with navy jeans. Both pieces are totally comfortable and will look great together. When it comes to shoes, this ensemble pairs wonderfully with Marsèll bombe sole military boots from farfetch.com. This combination of a black overcoat and black chinos is super easy to throw together without a second thought, helping you look on-trend and ready for anything without spending a ton of time going through your closet. When it comes to footwear, this outfit is round off perfectly with Marsèll bombe sole military boots. If you're all about relaxed dressing when it comes to fashion, you'll love this killer pairing of a red crew-neck sweater and light blue ripped jeans. 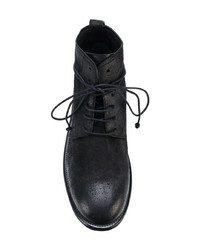 A pair of Marsèll bombe sole military boots from farfetch.com will bring a strong and masculine feel to any ensemble. 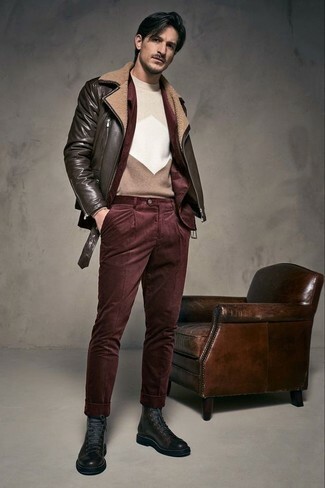 If you're on the lookout for a casual yet sharp look, consider teaming a dark brown leather biker jacket with burgundy corduroy chinos. Both items are totally comfortable and will look great together. Up the ante of your look with Marsèll bombe sole military boots. If you're searching for a casual yet dapper getup, team a black leather biker jacket with black jeans. Both garments are totally comfortable and will look great together. Turn your sartorial beast mode on and opt for a pair of Marsèll bombe sole military boots from farfetch.com. 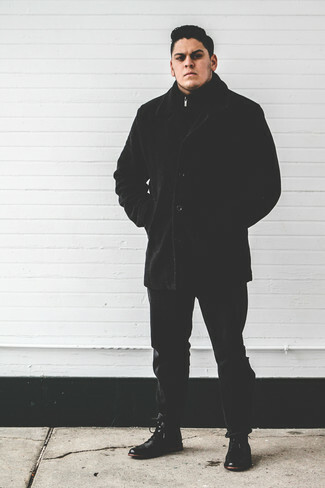 For a casually elegant getup, try teaming a black overcoat with black jeans — these pieces play nicely together. Round off this look with Marsèll bombe sole military boots.